AJB window cleaning provide a full exterior and interior conservatory cleaning service. This includes the cleaning of conservatory roof panels, finials, guttering, downpipes, upvc frames and glass. Using our purified water fed pole system we can clean off all dirt,grime and algae that builds up over time, our purified water fed pole system also enables us to clean any awkward to reach areas on the conservatory. 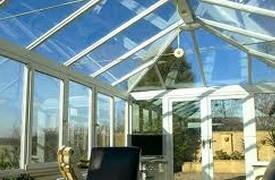 We recommend the cleaning of the interior of your conservatory after the exterior has been cleaned, this would include all roof panels, upvc and glass. This unparalleled service will leave your conservatories appearance in pristine condition.